Remember when Happy Harvey Day was a happy occasion? Remember when Mets fans chanted “Harvey’s Better” when Matt Harvey outpitched Stephen Strasburg in their first meeting ever three years ago at Citi Field? Those were the glory days. It seemed like a lifetime ago. These are tough times for Harvey. He has been awful this entire season. He may have pitched his worst game of his Major League career last night in the Mets’ 9-1 loss to the Nationals at Citi Field. Harvey had nothing against the Nationals. He was done in the third inning. He was behind the count, and his velocity was down, which he threw 88 mph. His curveball had no bite. His slider and his changeup did not scare any Nationals hitter. What was troubling was he did not compete in that inning. When the Dark Knight was pulled mercifully by Mets manager Terry Collins in the middle of the third inning after Ben Revere’s triple scored Wilson Ramos and Danny Espinosa to give the Nationals a 9-1 lead, he was booed on his way to the dugout. Harvey gave up seven runs in the third inning, and he gave up nine runs (six earned runs) on eight hits in 2 2/3 innings in his start against the Nationals. The Nationals batted around in the third inning. His struggles raised questions about what’s wrong with him. Is he hurt? Is something bothering him? Is he out of shape? Is he still feeling the effects of the Tommy John surgery after pitching so many innings of his career last year as a result of the Mets playing in the postseason? The Mets and their fans have every right to know what’s going on to a once great pitcher. It’s troubling he is getting worse every start he makes out there. It’s a concern when he gives in rather than compete against hitters, and that was the case when he intentionally walked Daniel Murphy to load the bases in the third. When was the last time Harvey walked a hitter? There’s no question it’s physical and mental with Harvey. One can also ask if he is in shape to pitch. He tends to be fatigued in the middle innings. Whatever the case, there’s no way the Mets can start Harvey Tuesday night against the Nationals at Nationals Park. He’s not in the right frame of mind to pitch. The Mets have a better shot to win with Logan Verrett than Harvey. Harvey needs to spend time on the “disabled list”. The DL is mentioned in quotes only because he’s not really hurt. He just needs time off, and that’s the case with him right now. What Harvey needs to do is work on his mechanics during bullpen sessions on his time off. He also could lose some weight while he is at it. He also can do some soul-searching on what he can do to be a better pitcher. 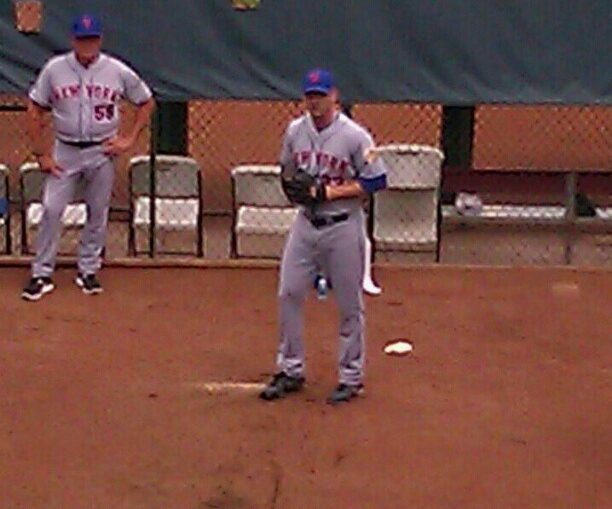 The last thing the Mets star needs to be is on the mound. There’s already pressure as it is for him to get better as it is, and he’s only going to compound his problems by being out there right now. He doesn’t deserve to be pitching with the way he has pitched this season. He has become an automatic loss when he is on the mound. It’s no wonder Mets fans were cautious to pessimistic when asked about how Harvey would do against the Nationals last night. The opinion here was he would pitch well with his counterpart on the mound. Strasburg was just the guy that would get him going. After all, Harvey loves pitching in a big stage. Citi Field was packed for this occasion. The Mets fans were hoping Harvey would deliver. Instead, Mets fans are now asking questions about what’s going on with the Dark Knight. It’s a good bet the Mets are asking questions about their troubled starter. The Mets have to hope something is physically wrong with Harvey. That’s the best scenario for them. If he is really healthy, then he and the Mets wonder if he reached his zenith. It’s something Harvey and the Mets don’t want to contemplate. The Mets need to figure out what’s wrong with Harvey right now. Their postseason hopes depend on it.